Visitors to Humboldt Redwoods State Park can hike 19 different trails stretching over 100 miles. Hiking trails vary in length and difficulty, so there’s something for everyone. One of the easiest and shortest is the Rockefeller Loop Trail near the Avenue of the Giants. It’s just a 30 minute drive from your independent hotel in Fortuna, CA. The trail is an ADA accessible 0.7 mile loop near Myers Flat, just north of the Founders Grove. It is the most popular trail in Humboldt Redwoods State Park, suitable for all ages and skill levels (www.alltrails.com). Within the Rockefeller Forest, the fallen Flat Iron Tree lies near the beginning of the trail. Its huge diameter measures 17.5 by 7.5 feet in cross-section. Farther along the trail, a walkway surrounds the Giant Tree, honored by the American Forest Association as the national champion coast redwood. The Giant stands 363 feet tall, with an average crown spread of 62 feet and a circumference of 53 feet. The intersection of the Rockefeller Loop with the Bull Creek Trail provides a clear view of the stand of ancient redwoods towering over the ground cover of redwood needles, ferns, and redwood sorrel. Humboldt Redwoods State Park offers over 100 miles of trails to explore, including some for horseback riding and biking as well as hiking. The Rockefeller Loop is one of 11 trails in Humboldt Redwoods State Park that are rated Easy by www.alltrails.com. Some of these trails are walks of a mile or less, while others range from about 2-3 miles up to over 7 miles. Hikers also can find a number of more challenging trails rated Moderate or Hard. 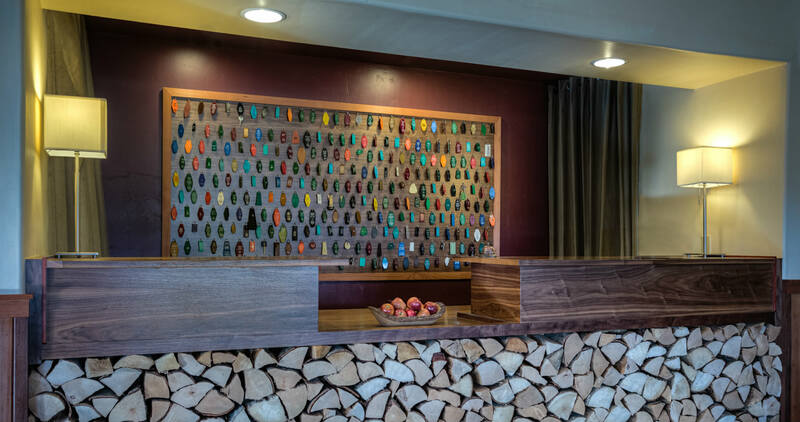 The Redwood Riverwalk Hotel is the perfect “base camp” for your vacation in the North Coast redwoods. It’s independent spirit and personal hospitality reflect the special sense of place you’ll find among our redwood forests. Please visit our website for lots of information about things to do, attractions to visit, tours to take, where to eat, and more. We’ll be happy to help you with plans for your trip as well as your reservation at our hotel – just give us a call at (707) 725-5500. 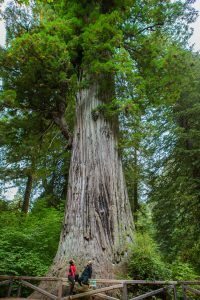 This entry was posted in Area Activities, General, Outdoor Activities, Things to do, Uncategorized and tagged Avenue of the Giants, easy hiking trail, Founders Grove, Hiking Redwoods, Humboldt Redwoods State Park, Rockefeller Forest, Rockefeller Loop Trail by admin. Bookmark the permalink.